It is important that we work together to make the tabletop community a safe and inclusive place. To that end, here are some tools you can use in your own game. We will continue to add and modify the sections on this page. If you feel there is a post, article, image, or rule set we should add, feel free to contact us. We all struggle with mental health. Some of us more than others. The character Wyatt in our content is dedicated to Wyatt Ferris, who lost that fight. If you, or someone you know, struggles with thoughts of suicide, please seek help. We are a huge community and there is help for you. The National Suicide Prevention Lifeline offers free, confidential crisis counseling 24/7/365. You don't have to be suicidal to call. 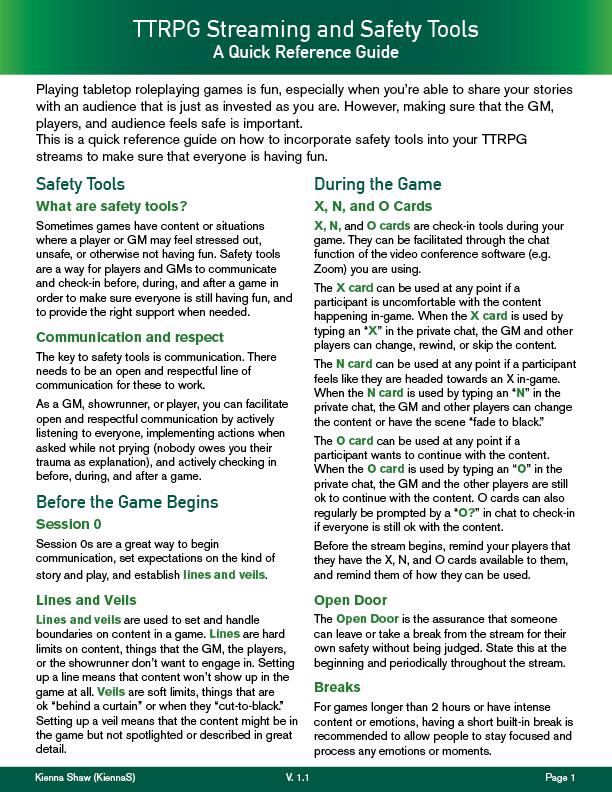 Community member Kienna Shaw put together this great image that compiles most of the common safety tools used in games. We have reposted them here with her permission. Please take the time to read through and implement the ones that work best for your game. We strongly suggest Session Zero as an absolute must for every single game you play.